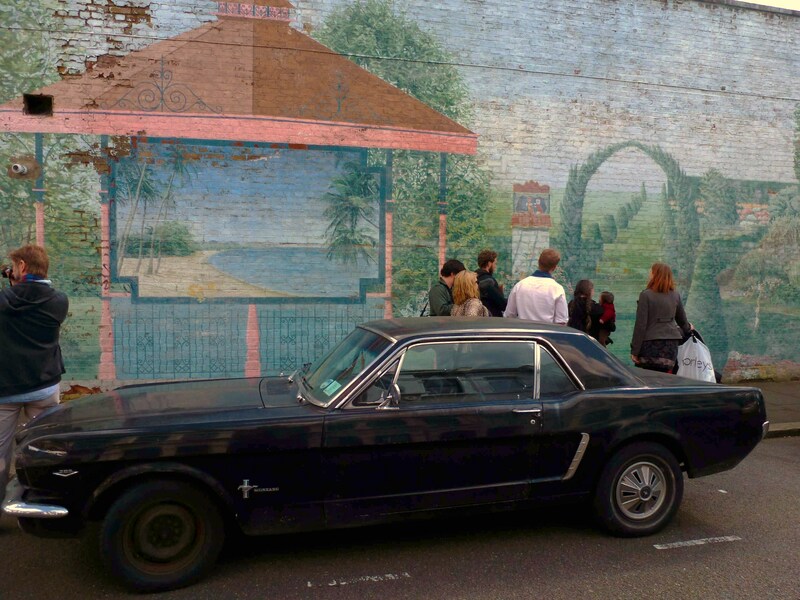 Earlier this year we got the exciting news, that plans were afoot to repair the murals on the Lambeth Walk. Creative Sparkworks and Ethelred TMO are working to repair the artworks which consist of five paintings on boards which were created in the early 1980s by muralists, Gordon Wilkinson and Sarah Faulkner. 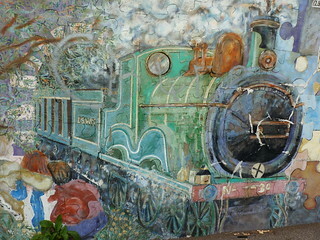 Each mural shows a different aspect of Lambeth Walk life, from the women artists at the Lambeth Doulton factory, the local stars of the music hall to life on the busy market street of Lambeth Walk. 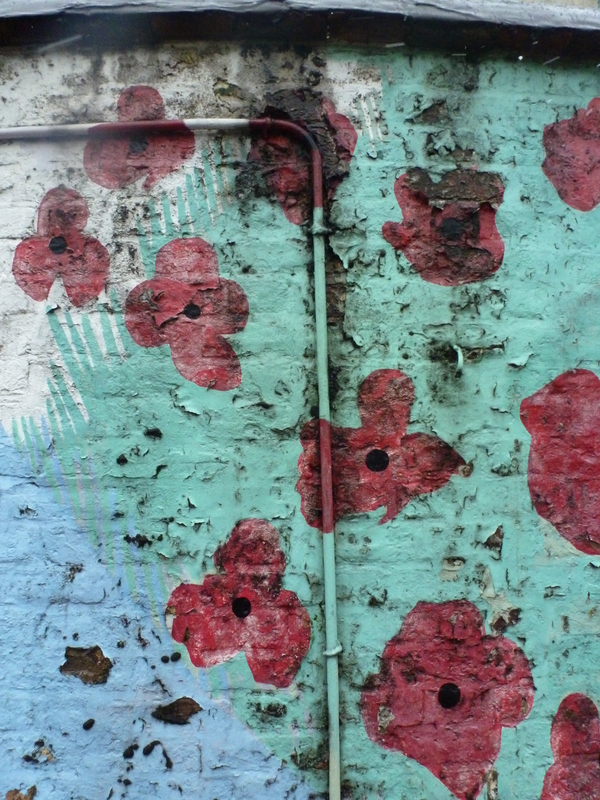 To mark the beginning of their project, an event will be held on 24th May from 12pm to 2pm outside the murals which are located on Lambeth Walk. There will be a chance to learn about the history of the area, hear some music hall songs, have some pie and mash and meet the original artists. Apologies for the general quietness on the blog. We have been working away on lots of different things, trying to keep murals in their communities so that the next generation can enjoy them! Back to the subject of the title! 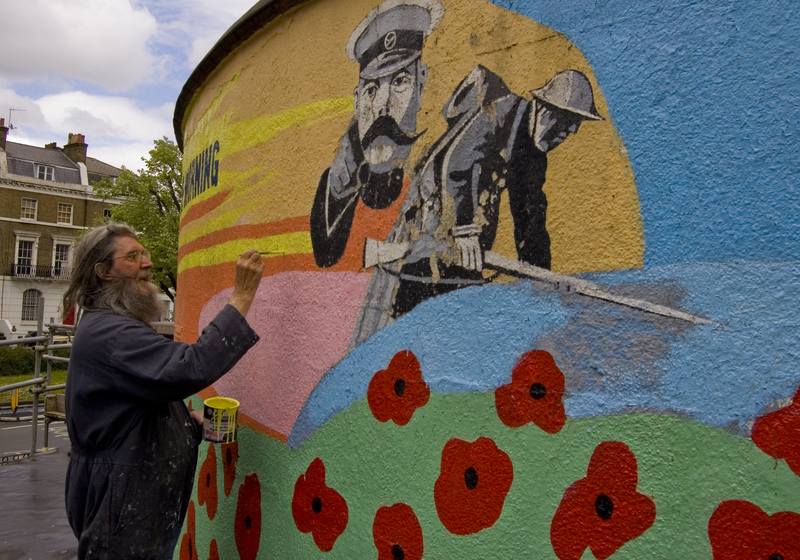 Spring and summer has been spent repairing and repainting the Stockwell Memorial Mural. 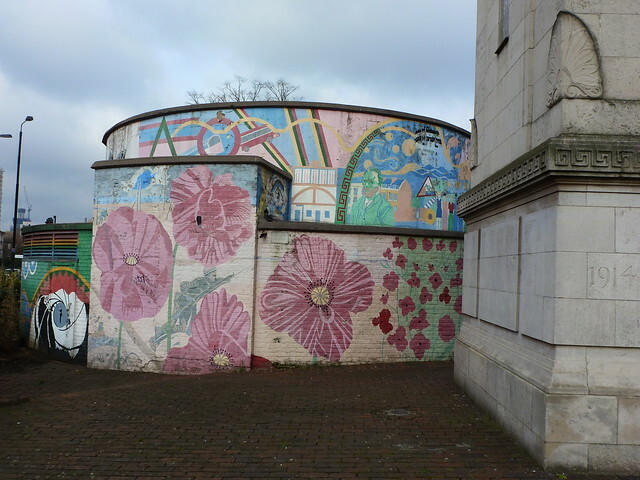 The mural is painted onto a rotunda that covers the entrance to one of south London’s deep level shelters. The last few years had seen an increase of deterioration particularly on the top part of the structure. There was also water damage from ineffective drainage causing the growth of moss and damage to the bricks and mortar. On close inspection it really was a sorry state. So with a team of volunteers, original artist Brian Barnes and assistant Morganico, work started by removing flaking paint, filling holes and treating as much damage as possible. The first few sessions were in the snow as the end of March and proved to be exceptionally cold; we only lasted 30 minutes before we had to give up! Volunteers from the Friends of Stockwell War Memorial and Gardens were there week in, week out slogging away at all the work that needed doing. Spring turned into summer. Paint scrapers were swapped for paint brushes. 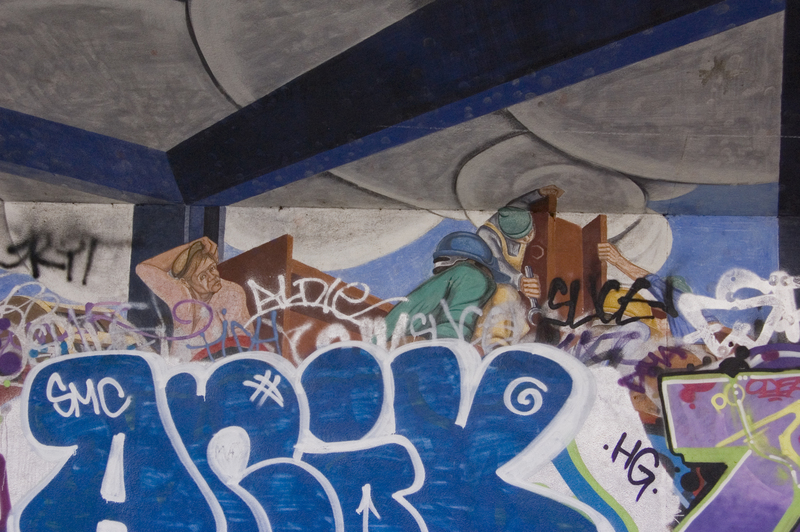 A scaffold went up around the structure and Brian and Morgan beavered away at the top part of the mural. More paint fell away from the surface and large sections had to be re-drawn. Slowly the patterns, faces and colours reappeared around the top part of the rotunda. Six weeks later the scaffold came down. And the workers continued on the bottom. 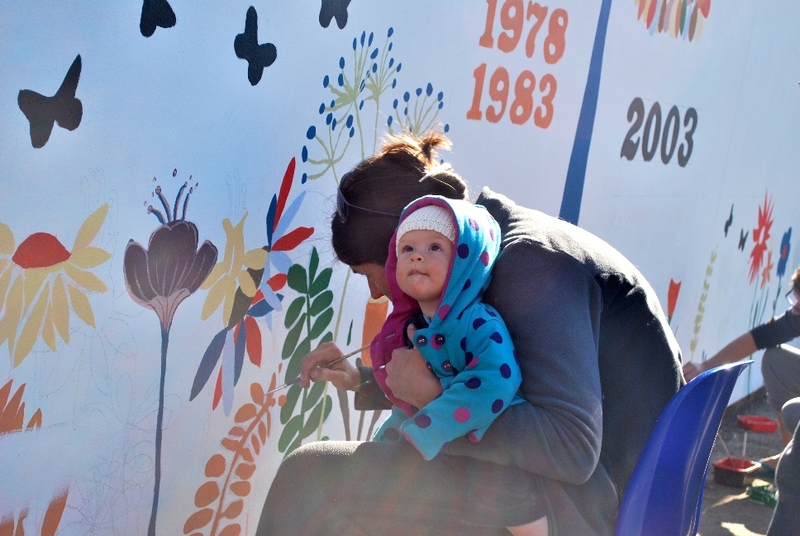 We held a paint a poppy day where young and old painted a poppy. More volunteers arrived rallied by the call of Naomi Klein of the Friends of Stockwell memorial and Gardens. 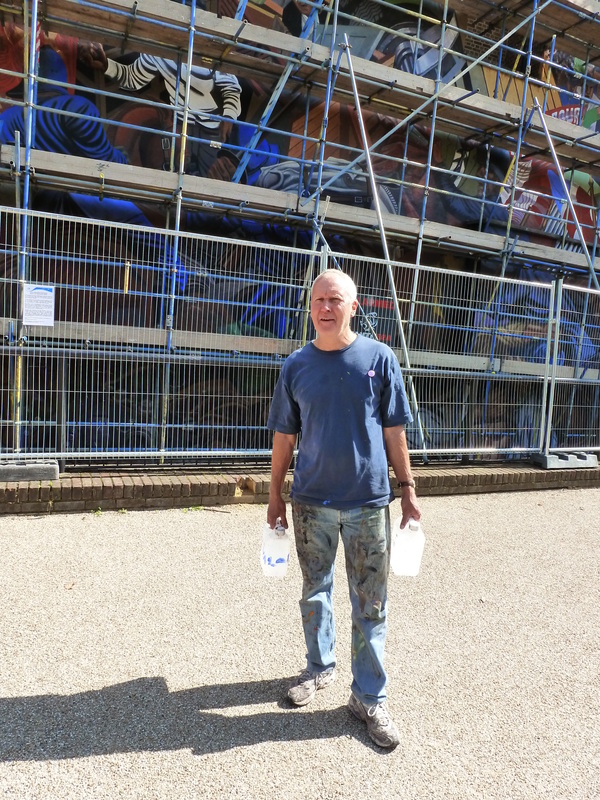 She was a huge assistance to this repair helping pick up the paint from the supplier, rally the team and support the London Mural Preservation Society in making sure it all ticked over. Lots of people popped down to visit the works as spring moved into summer and still the artists and volunteers pushed on with trying to finish the undertaking. From the extremes of the cold spring to the furious heat of the summer, the volunteers were really asked to show their dedication. Catherine, Nicola and particularly Saskia turned up again and again to support the work being undertaken. The last push to get the remaining work done was encourage by Saskia as the last weekends of summer started to go and it was now a race against the approaching autumn and the potential for rain! September came and Naomi and myself planned an opening event. 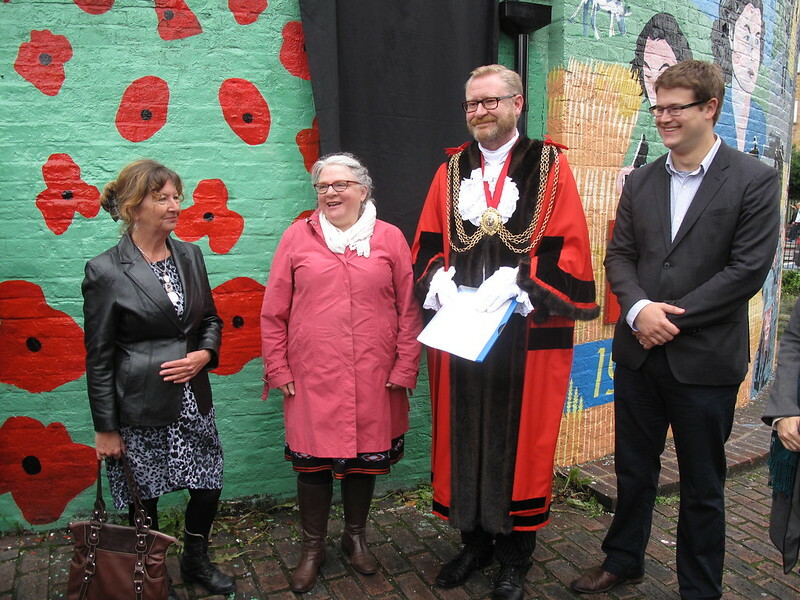 The Mayor was invited to unveil a plaque to mark not just the repair of the mural but also the repair of the World War One memorial next to it. This was something important to local residents particularly to the families of those people listed on the memorial. The finishing touches to the mural were added the evening before the event, the plaque was put up and everything was ready to go. Saturday 14th September, the plaque was unveiled by the Mayor of Lambeth Cllr Mark Bennett who gave an interesting speech about the local history of the area and the memorial. 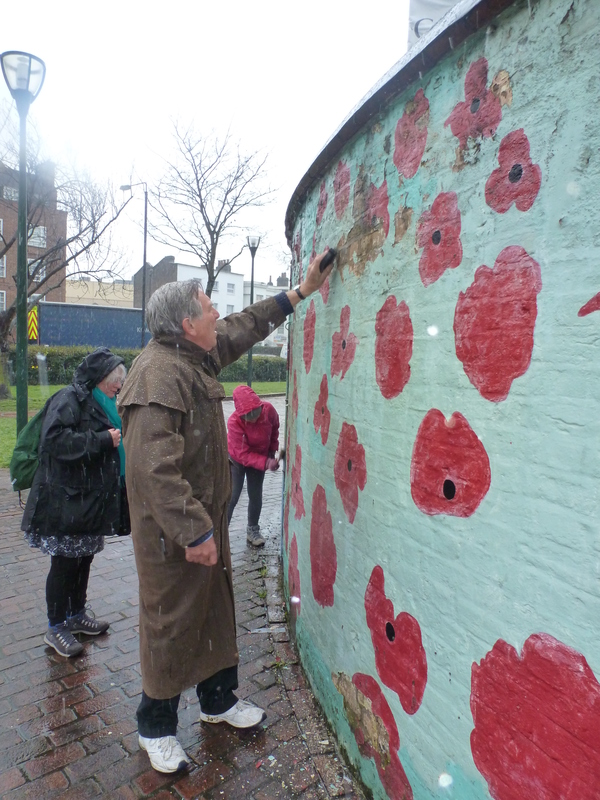 A small crowd turned up either linked to the memorial or to the work on the mural. The rain held off though we could have sheltered under the gazebo kindly lent to us by the Brixton Society who also supplied some photos of what the area originally looked like. It’s a good day when you know another mural enjoyed by the community has been repaired. Maybe it’ll even inspire some people to go and paint more murals. 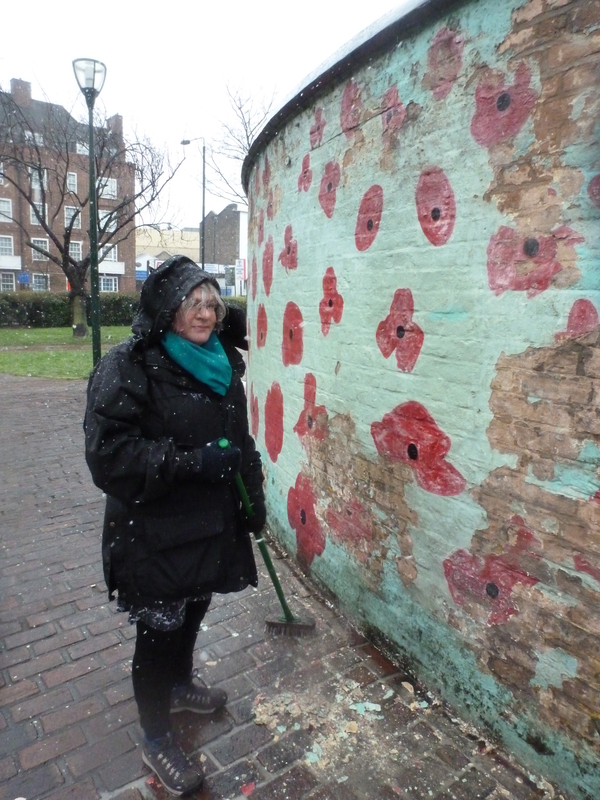 Since that snowy Easter weekend preparing the Stockwell Memorial Mural for restoration much headway has been made. Whilst the walls were in fairly rough and crumbling shape, anyone who has headed down the South Lambeth Road of late will testify that the Mural is now shaping up; the restored colours adding a real punch to the original design. 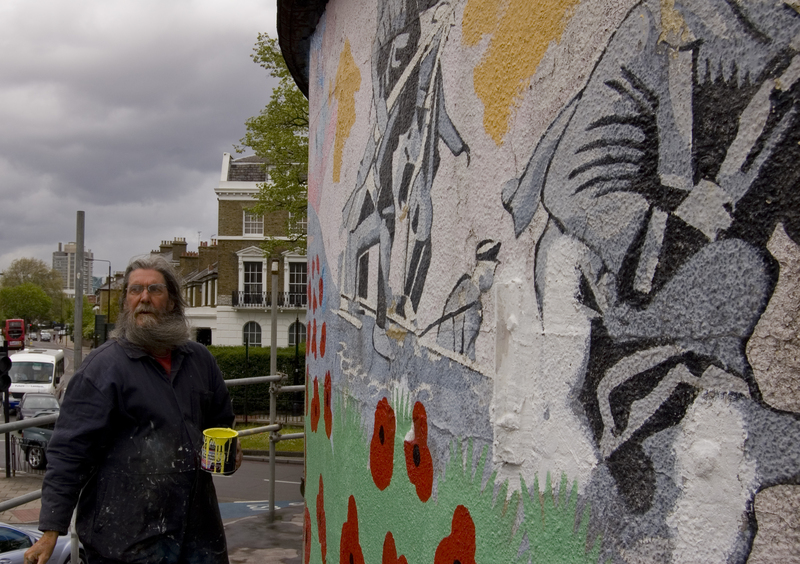 With the help of Morganic, French filmmaker Julien Ferdinande and a sprinkling of volunteers, Brian Barnes’ restoration of the 1999 mural is progressing well, but we would like to put out a call for volunteers for this Sunday 19th May, to help us progress with the lower rotunda and in particular the poppies. The Stockwell Memorial was erected in 1919 in memory of the 600 local men who died during the First World War. 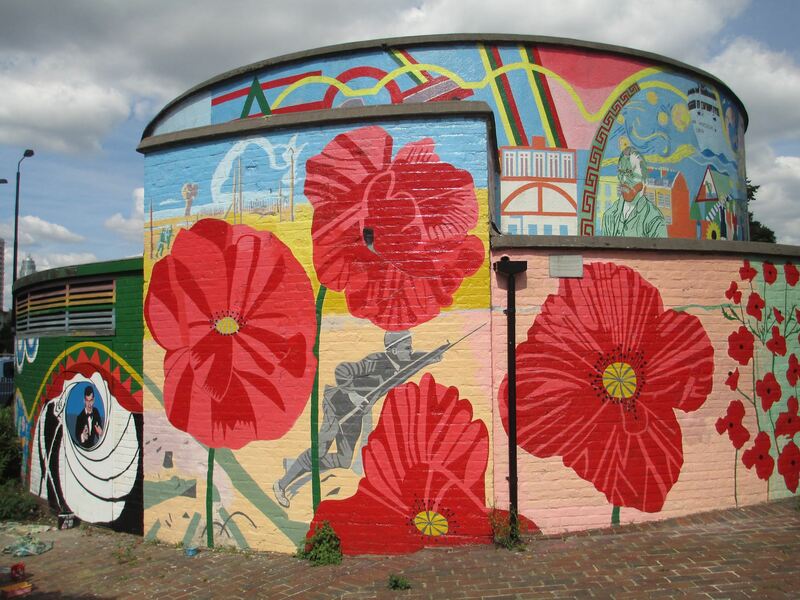 As Barnes explains in this recent film by Julien Ferdinande, his 1999 design for the Memorial Mural allocated one poppy to every two men killed in the conflict – with a total of 300 poppies across the mural. This Sunday, therefore, we would like to invite volunteers to come along and help us pay tribute to those killed in the war and paint a poppy. Please reply to stockwellmemorialfriends@gmail.com if you are able to help. Wear old clothes, bring paintbrushes (variety of widths if you can), some brush cleaner (if you can), and rags. Don’t worry if you don’t have all this – come anyway! 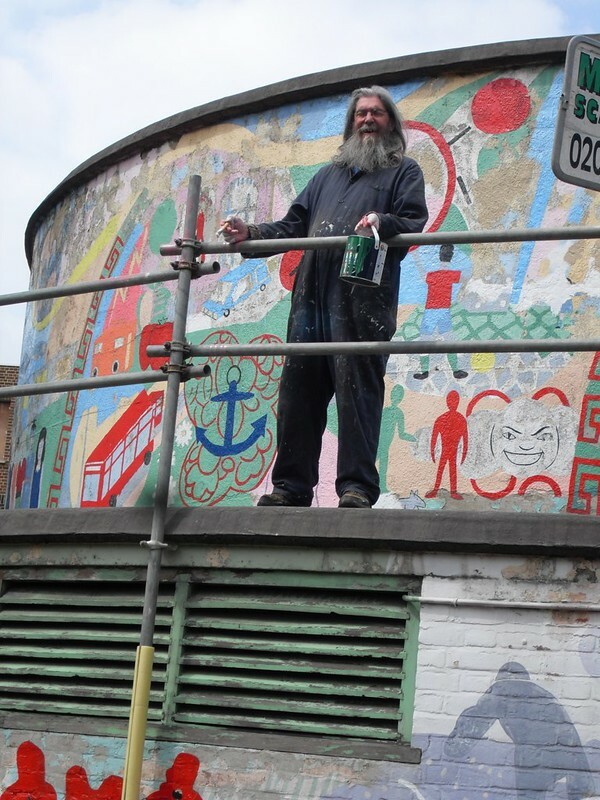 The London Mural Preservation Society is delighted to see another mural repaired. 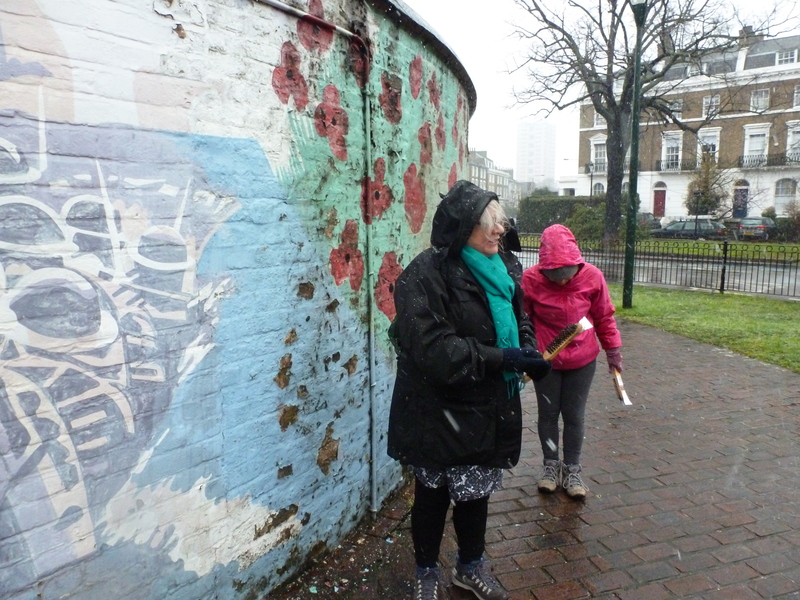 We have been involved with Lambeth Council and Friends of the Stockwell Memorial from the beginning of the process and look forward to seeing the outcome of the repair work to both the memorial and mural. 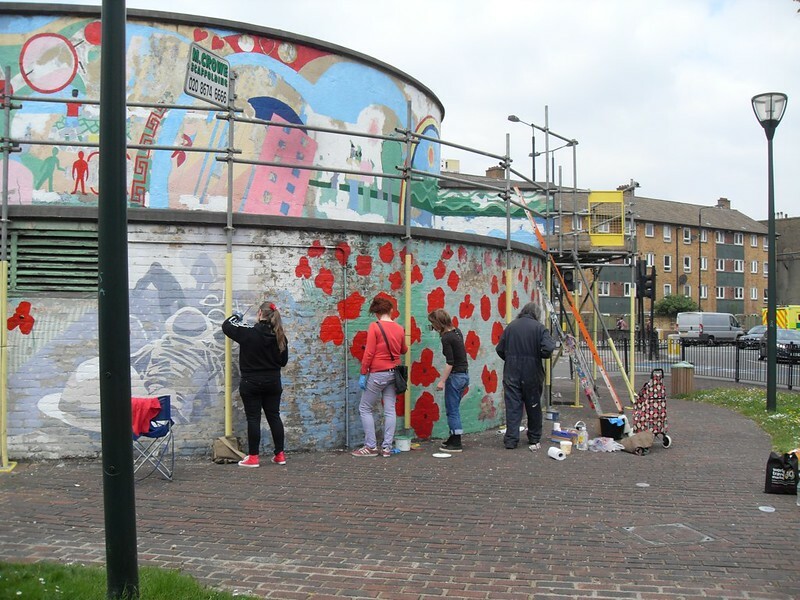 If you visit the Brixton Windmill Gardens over the next few days, you’ll see Camila Cardenosa busy at work adding finishing touches to the Hands On Windmill Gardens Community Mural. She’ll welcome you with a smile, offer you a paintbrush if you’re willing to give it a go, and let you know that it’s easy and you don’t have to worry about making a mistake. All of these being things you want to hear when putting a brush to work; because it’s scary, and you’re obviously no good at this, and you’re bound to make a big mess (that’s what everyone says). But Camila’s got a friendly convincing way about her, that will have you painting away in no time. Columbian by origin, Camila is currently studying Graphic Design at Central Saint Martins and her focus is on examining how graphics can contribute to giving people a better sense of place and identity within public spaces. 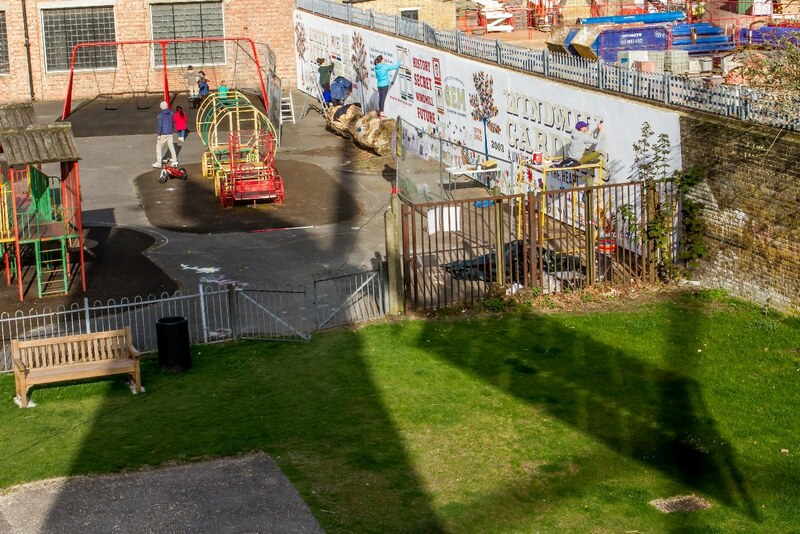 This mural is part of her final year project and has turned out to be an amazing collaboration, bringing together the Friends of Windmill Gardens and the members of the local community of all age groups. 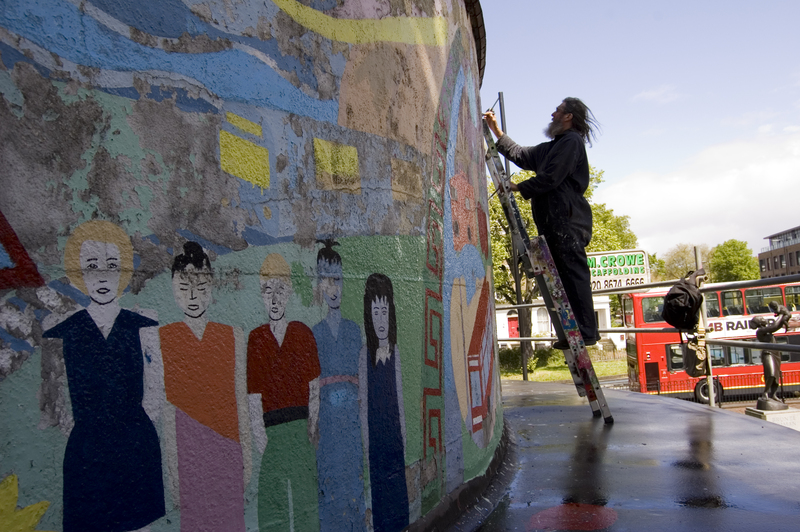 While designing the mural, Camila and Stephen Lawlor, a visual artist and Education Officer for the Brixton Windmill, conducted several workshops with local schools and adult groups, so that the mural could be designed around the history of the windmill, how the local community relates to the it and their hopes for the gardens in the years to come. 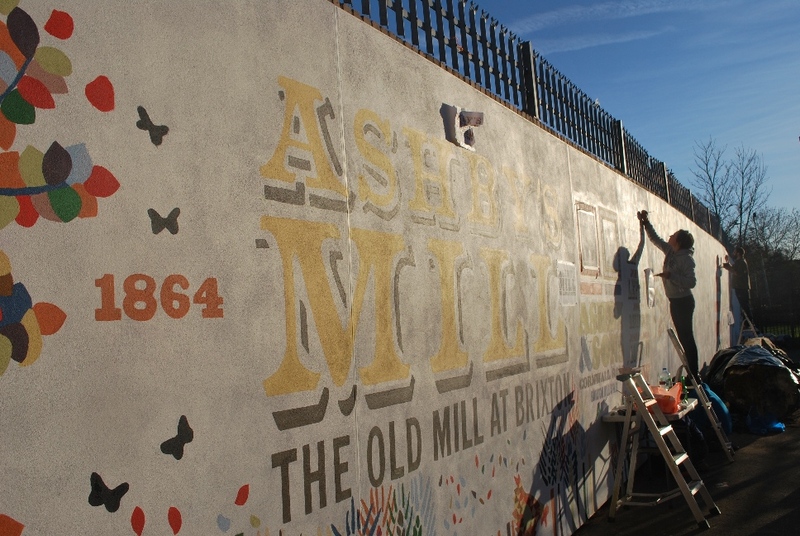 The final design for the mural comes from the fonts, imagery and text that emerged from these workshops, and added value has been worked into it so it can be used as a visual aid to tell the story of the miller and the historic windmill. 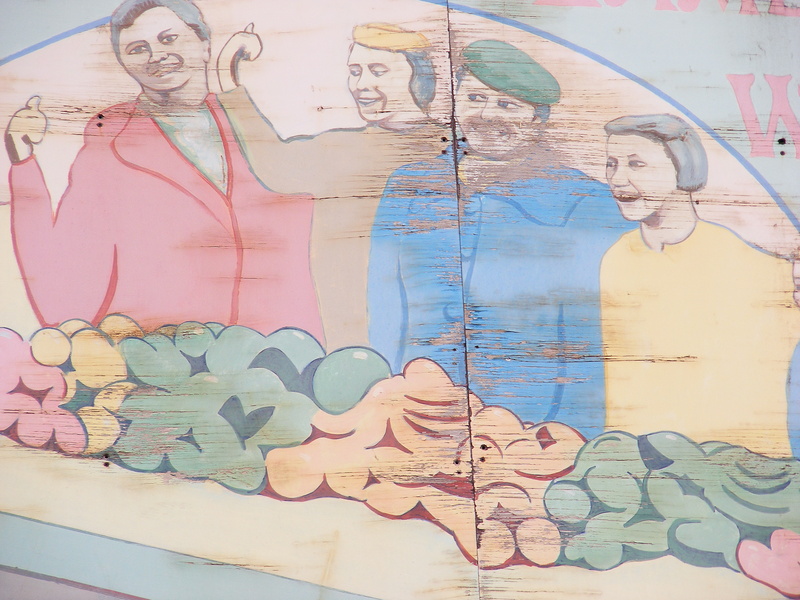 The mural is longer than it is taller, and has been designed in such a way that the parts closer to the ground are highly illustrative, thus giving younger people a chance to play an important role in the painting. 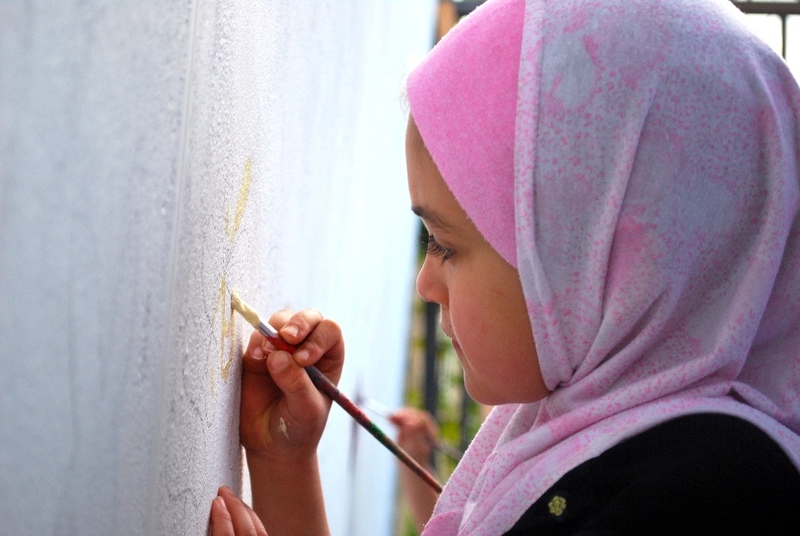 At the same time, the fact that it is being hand painted ensures that everyone can be involved. 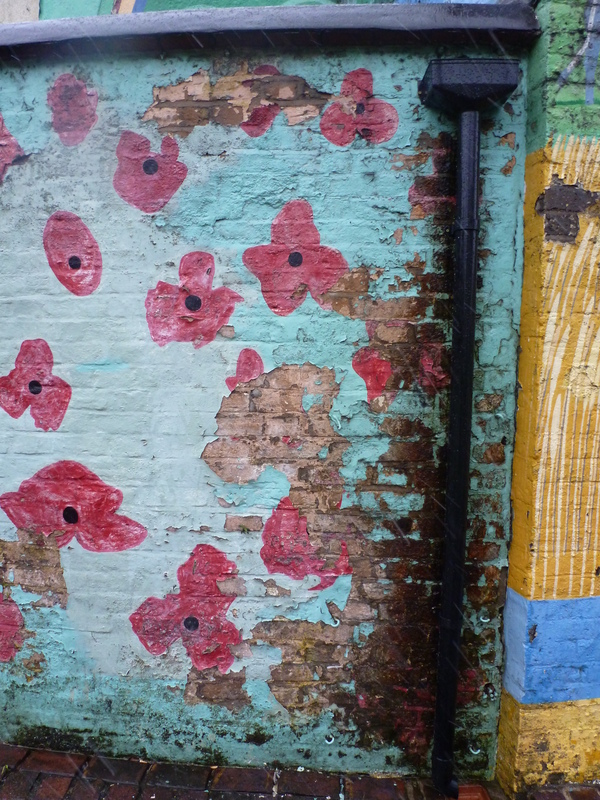 It has taken months of coordination, unpredictable weather, many painstaking hours of painting, and the ideas and efforts of over 200 Brixtonians, for Camila and her team to bring this project together. And finally the finish line is near. One for the future. Photograph by Camila Cardenosa. 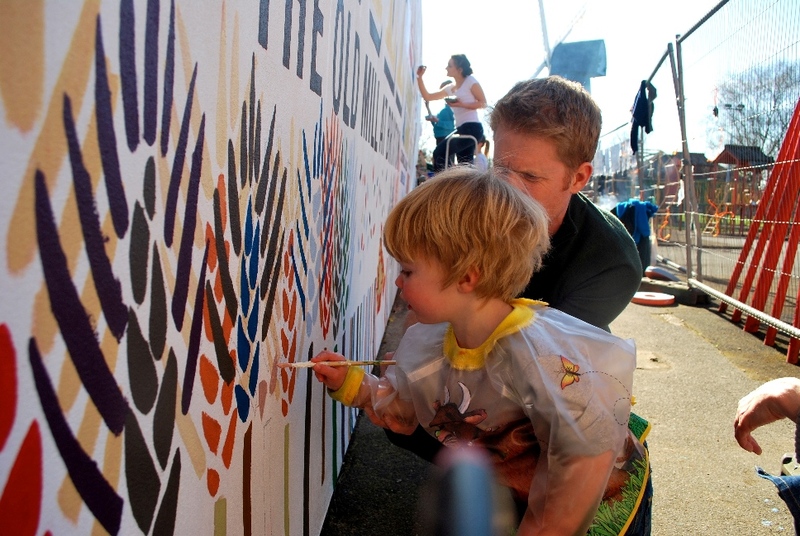 The Hands On mural will be officially launched on Monday 6 May with a special celebration and everyone’s invited. It isn’t every day that a mural is created from scratch, using such a democratic process (albeit some artistic direction from Camila). It will definitely be interesting to see in the months ahead, how the project and the mural itself impacts the community around it. To see images of Camila and the others at work, check out the Hands On Windmill Gardens website. A project that started out with one idea, this has grown into one that has drawn many in. 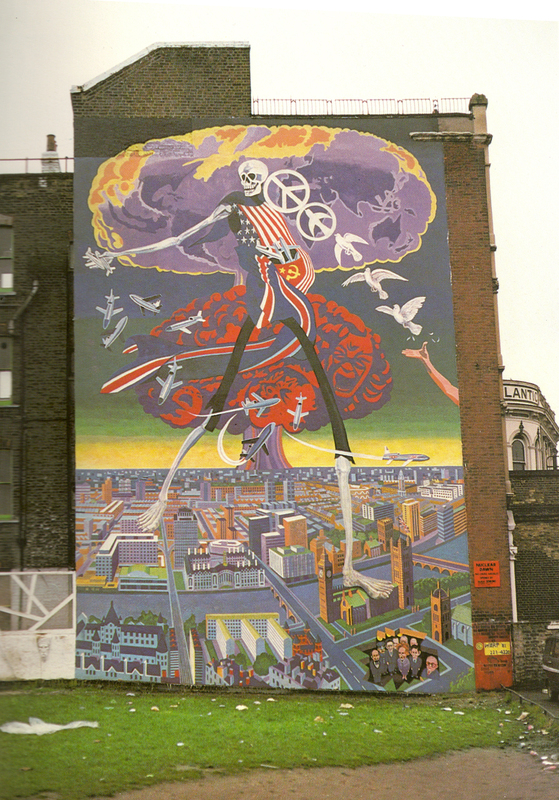 In a month that has seen much thought cast on the pre-Thatcher state of affairs it seems worth paying a visit to two of the most forceful and controversial murals of the 1970s. 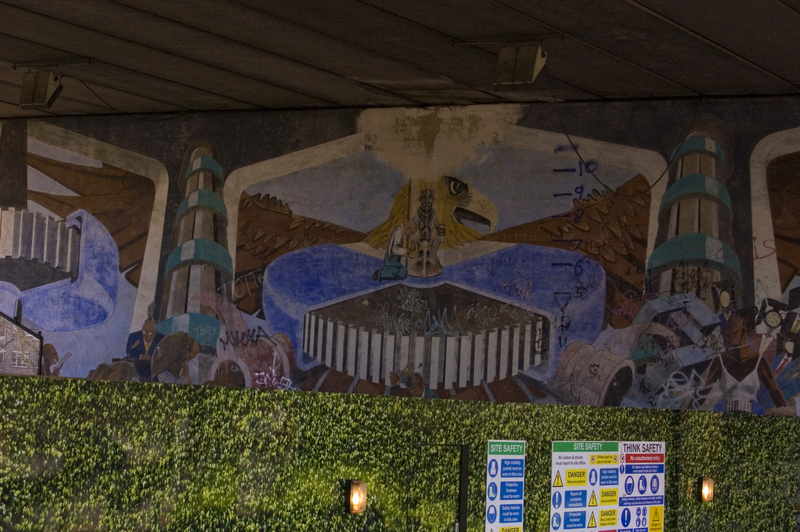 Tucked away beneath the Westway, just to the North of Royal Oak tube station, David Binnington and Desmond Rochfort’s Royal Oak murals were completed in 1976-77 and stand as testaments to a not so distant (but rather short lived) age of large scale, ideologically charged, political murals. 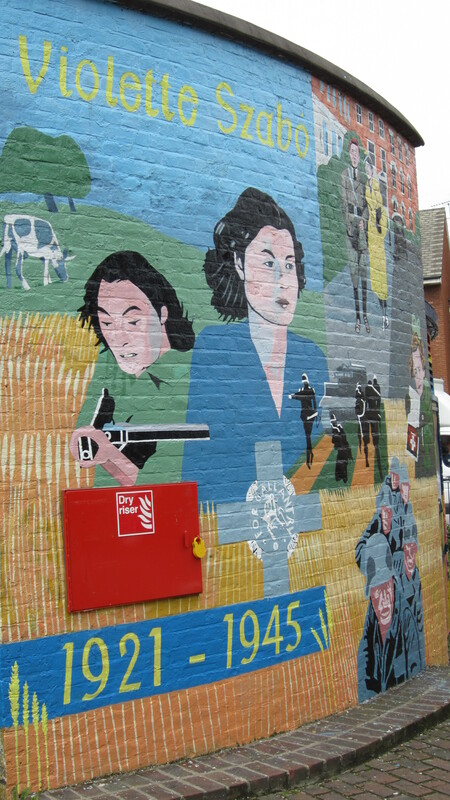 Heralded by Richard Cork as ‘an object lesson in how publicly sited murals can gain great resonance in their surroundings’ and by William Feaver as ‘a large dose of social realism [that] has done wonders for the grey desert of Royal Oak’, they were dismissed equally vehemently. Sarah Kent saw them as pathetic examples of pseudo-Socialist Realisms and Peter Fuller as a ‘montage book of art clichés’. 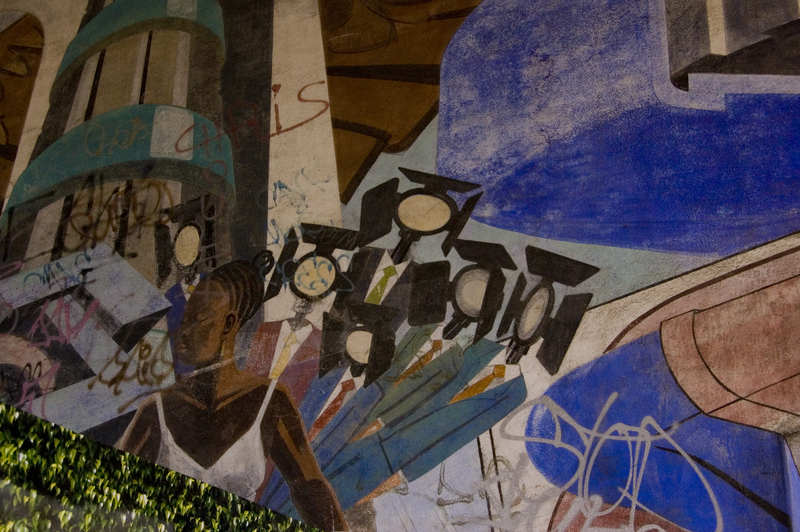 Shrouded in controversy from the off, therefore, the murals provide a microcosm of the ideological dissonance of their time, and reveal the extent to which murals once played a forceful role in these wider polemics. Arriving at the murals today you might be forgiven for missing their once iconic status. Buried in graffiti to a height of six feet or so, and now partially obscured by the hoardings of a Crossrail generator site, they – like the debates they touch upon – have not escaped the hands of time. With this said, above the height of eight feet they remain in remarkably good condition – no doubt owing to the fact that they were some of the first murals in London to be executed in the laborious but highly durable Keim silicate paint. On approaching the murals from Royal Oak station (a right out the station and a swift left under the shadows of the Westway) the first thing one notes is a giant cog, which looms illusionistically over the Crossrail hoardings. It is only with the sight of the eagle which perches to its left, however, that you notice that the cog is in fact a part of Binnington’s cycle – stretching across the concrete pier of the motorway. Whilst the upper portion of the mural reveals something of the overall statement – the driving mechanisms of the Capitalist system, the strange offering made to the glass enclosed emperor figure, and the media workers dissolving into the apparatus of their trade – the current obscuring of the lower section hides the long benches of office workers – passively awaiting missives from above – who lie at the heart of the mechanical system. We can only hope that the completion of the Crossrail construction will reveal them once more to the public gaze. As we move round the pier to the right Des Rochfort’s homage to construction workers hovers above. Stretching out across the diagonal slant of the pier it is as impressive and engulfing as it is difficult to photograph. It was Rochfort’s panel that seemed to draw the more favourable comments in its time – and has survived the best. It portrays what William Feaver described at the time as ‘Herculean’ figures at work upon giant scaffolds and cranes. Utilising the multiple perspective schemes pioneered by David Alfaro Siqueiros it commands the space below – our attentions shooting off into the blue skies via the monumental figures of the workers. Sitting, as it does, on one of the largest scale urban constructions of its time (and, indeed, right next to a present day one) it seems a fitting tribute to the human labour which is, after all, the engine of such projects. 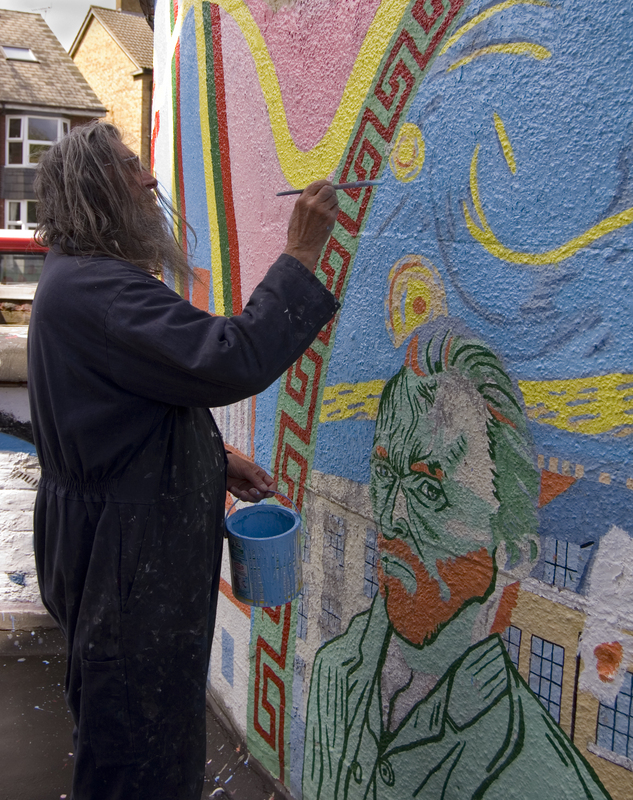 Funded by Abbey Harris the murals were, at the time of their completion, the largest exterior murals in England. 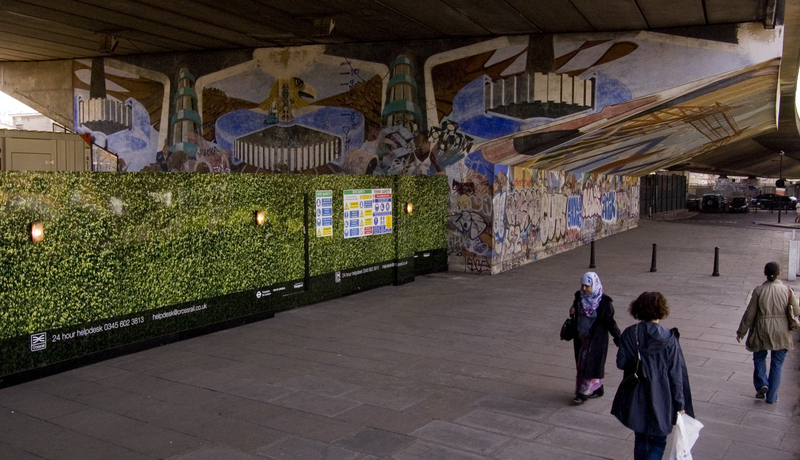 They followed from extensive consultation with the local community (which had been torn in half by the construction of the Westway some half decade previously), and were intended to offer a focus to their thoughts and concerns and to animate the desolate wasteland created by the Westway’s construction. 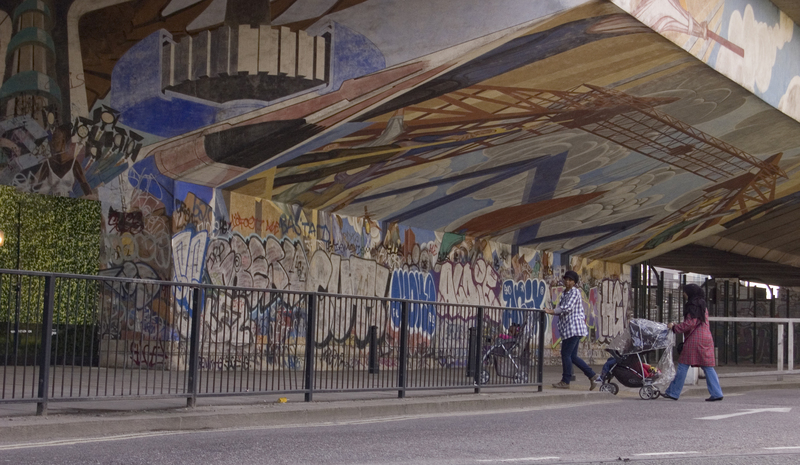 It is difficult to gauge the extent to which the murals succeeded in the first regard – for the raw cut of the Westway through the area continues to obscure any overt signs of community embrace. To this day, however, they offer a focus of contemplation and symbol of conviction amidst the concrete expanses of the underpass. 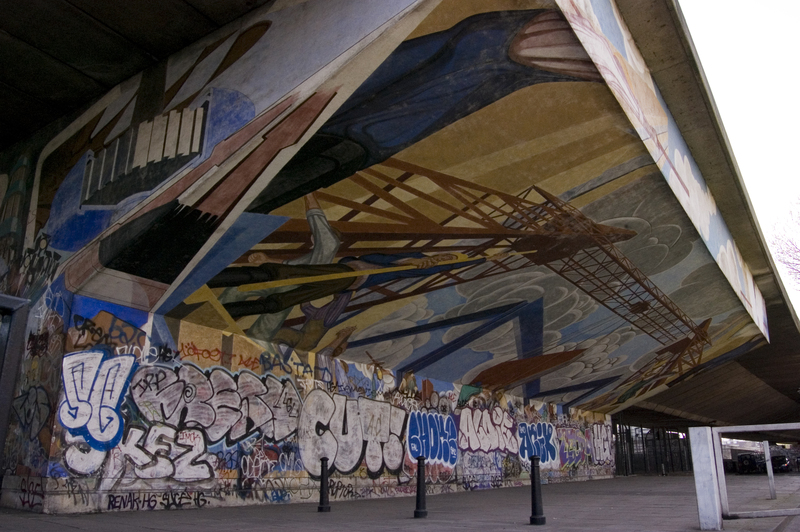 More concrete is the influence the mural scheme had upon other projects – serving as a rallying point and mark of ambition for a new generation of mural artists who were coming to the fore. 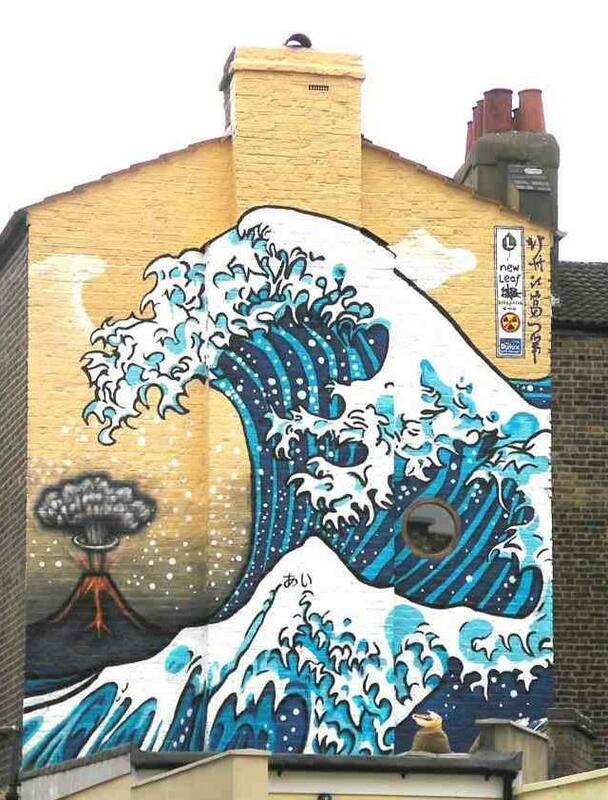 Most specifically, in their wake Dave Binnington became involved in the planning of the Cable Street Mural. Whilst Binnington eventually desisted from work on Cable Street, Paul Butler – who had contacted him and Rochfort during their work on Royal Oak soon became involved – and encouraged Rochfort (and Ray Walker) to help him see Cable Street to completion. Des Rochfort was to go on, in the 1980s, to write two seminal studies on the Mexican muralists whose influence is so discernable in both Royal Oak and Cable Street. The murals remain a startling reminder of the ideological convictions of the 1970s mural movement, and their message resonates strongly to the present day. 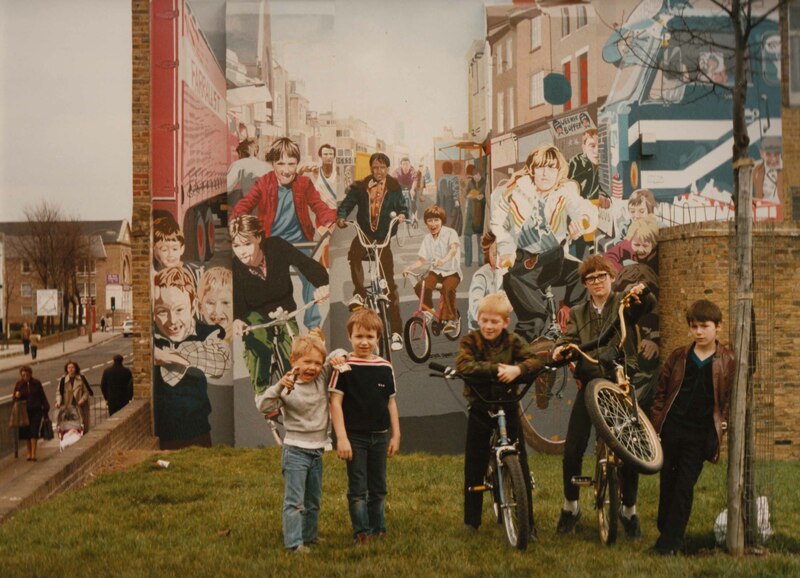 It seems unlikely that Crossrail or the Mayor of London could be tempted to see the murals restored to their former glory as a compensation to a community once more disturbed by a heavy development project which will do little for local residents. It is to be hoped, however, that in dismantling their hoardings the murals will at least be left in as good a condition as they were found. They remain some of the iconic works of the era.